This annotated image tracks the life of a sun-like star, from its birth on the left side of the frame to its evolution into a red giant star on the right. Image released Aug. 28, 2013. Astronomers have found a twin star to Earth's own sun, only much older. The rare star is the oldest known "solar twin," and offers a peek at what Earth's star will look like in 4 billion years. The star, called HIP 102152, appears to be as similar to the sun in its basic characteristics as any other known star. However, whereas the sun is only 4.6 billion years old, HIP 102152 is 8.2 billion years old, and so represents a sun-like star at a very different stage of life. In fact, it's the oldest solar twin ever seen. "For decades, astronomers have been searching for solar twins in order to know our own life-giving sun better," research leader Jorge Melendez of the Universidade de São Paulo in Brazil said in a statement. "But very few have been found since the first one was discovered in 1997. We have now obtained superb-quality spectra from the VLT and can scrutinize solar twins with extreme precision, to answer the question of whether the sun is special." This image shows solar twin HIP 102152, a star located 250 light-years from Earth in the constellation of Capricornus (The Sea Goat). Image relesased Aug. 28, 2013. This star's discovery helped solve a longstanding mystery about the sun: Why does it have so little lithium? One of the most basic elements on the Periodic Table, lithium was created in the Big Bang, along with hydrogen and helium. The composition of stars usually reflects the abundance of elements in the material out of which the star formed. But the sun contains just 1 percent of the lithium that was present in the gas cloud that birthed it. It turns out that HIP 102152 has even less lithium than the sun. 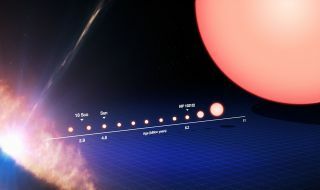 Previous research has suggested that younger stars contain more lithium than older stars, but the discovery of HIP 102152 has allowed scientists to formulate a clear correlation between age and lithium content for sun-like stars. This wide-field view captures the solar twin HIP 102152 in the constellation of Capricornus (The Sea Goat). "We can now be certain that stars somehow destroy their lithium as they age and that the Sun's lithium content appears to be normal for its age," TalaWanda Monroe of the Universidade de São Paulo, first author of the paper reporting the discovery, said in a statement. The new study also turned up another exciting tidbit about HIP 102152, suggesting this star is even more sun-like than it seems. Both HP 102152 and our sun are deficient in certain elements, which happen to be common in Earth and in meteorites from space. Researchers think this might indicate that rocky, terrestrial planets like Earth might orbit HIP 102152, too — a possibility that means perhaps, just maybe, HIP 102152 also supports life. The discovery will be detailed in an upcoming issue of the Astrophysical Journal Letters.